Continuing with my favorite series: Boss Babes! One thing I love about the blogging community is meeting incredible, strong, beautiful, courageous and wildly talented, smart, innovative, entrepreneurial boss babes, chief chicas, inspiring women. Every month, I'm going to spotlight one of these incredible role models and share a little bit about what makes them amazing. This month’s babe, or should I say babes, are some of the most inspiring ladies on the ‘gram. Dale and Elizabeth run Sweats And the City, which is a one-stop-shop for all things fitness and wellness. They are so fun, honest + healthy - it’s very inspiring. Read on to learn more about these boss babes. 1) We are in love with your Instagram @sweatsandthecity! Tell us more about it: why did you decide to create it and what do you hope to accomplish through the page? Thank you so much! The concept of Sweats & The City came to us a few years back when we were roommates. 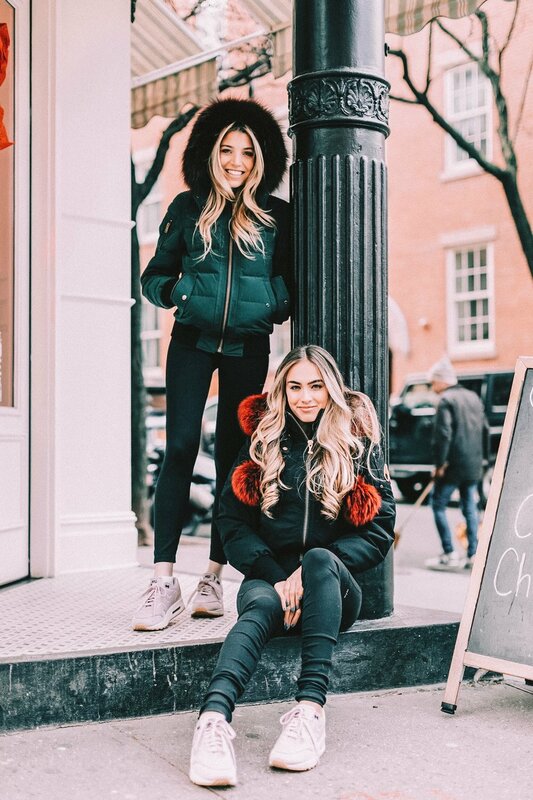 We had both developed a strong passion for boutique fitness - and absolutely loved the community aspect, as well as trying out all the different classes NYC had to offer. As we started exploring the New York boutique fitness scene, we found ourselves, night after night, discussing the various studios we had tried, forming unique opinions on each. We really felt as though there was an opportunity in the market to offer reviews, tips and tricks to others so they could go into these studios knowing exactly what to expect. From there, we've expanded to an all encompassing health + wellness Instagram account and blog. 2) Is Sweats and the City your full-time job? Tell us more about your day-to-day. Yes! We both quit our 9-5 jobs and started full-time SATC at the beginning of 2018. We are SO HAPPY we did this. Our day-to-day definitely varies; however, the bulk of them are generally filled with meetings, correspondence (so many emails! ), organizing collaborations, shooting content, keeping up with our social media, and the behind the scenes, not as fun, aspects of the business (communicating with our lawyers, accountants, etc). We also always host tons of events. We've been traveling more lately, (because fitness is EVERYWHERE!) and recently went on a trip to Miami with Puma. 3) You get to try out and review all different types of workouts for Sweats and the City. What's your favorite workout? So many! We love: Megan Roup's The Sculpt Society, Core Power Yoga, Rumble, Flybarre, P.Volve and Solidcore, just to name a few! 5) What is it like running a blog with a friend? What are the best parts and what are the challenges? It's always awesome to have someone to run everything by, two heads are truly better than one. We each bring different personalities, perspectives and personal strengths to the table, which we believe has truly grown the brand into what it is today. It is definitely scary to put yourself out there on social media and having a friend to do it with absolutely makes it easier and more comfortable. That being said, in a partnership you have to make sure you're both happy with every decision or can at least compromise. When you're working solo, you can pretty much do whatever you want without having to consult anyone, so having a partner definitely requires team work! 6) What do you see for Sweats and the City in the future? Any resolutions coming into 2019? We hope to one day launch our very own product and to continue to innovate our platform and brand. Since we started SATC, we’ve seen so many similar blogs pop up, which is awesome, but has encouraged us to differentiate. We also hope to travel more, and take more opportunities outside of NYC! 7. Go back to college graduation: what would you tell yourself? D: You do not need to know what you want to do when you graduate! It takes time to figure it out and so much can change. It's so funny to think about how much I would stress over this in college and how I've ended up in a completely different field. E: Trust the process! I went to a pretty competitive college (go blue!!) and found graduation time to be super stressful, especially because so many of my friends, sorority sisters and schoolmates had their *DREAM* jobs all lined up, and I did not. I never though I'd make it to NYC without the connections and money that a lot of my peers had. And I definitely never thought I'd make it to NYC AND run my own business. What I've learned is that if you really want something, you will make it happen! 8. How do you find inspiration? D: Definitely from real life experiences. You can scroll all you want on Instagram, but traveling, getting out there and meeting people is so inspiring. D: My mom: She is the most patient and least judgmental person. She gives such great advice that I’ve carried with me my entire life. D: Frozen Yogurt from GoGreek in LA! D: I love fruit! Especially tropical fruit. If I have a big bowl of fresh mango, papaya and pineapple I’m in heaven! D: This is a tough one, I've read a lot of amazing books. I just finished "Then She Was Gone" and really enjoyed that one. E: The Four Agreements. It really helped to shift my life perspective, and I really think anyone can benefit from it's messages. D: WordSwag, I can spend hours playing around with it and creating content. E: My sister showed me the app 'Personal Capital' over the holidays and I feel like a total nerd saying this, but I'm totally obsessed. It lets you link all your banks, loans, 401Ks, etc all in one place so you can stay on top of your finances. I find this app to be such a headache saver! D: @avokween -- I love absolutely every thing she posts about, she's such a breath of fresh air on instagram. E: @TheSkinnyConfidential -- she is such a savvy, brand-building business woman and also highly entertaining and individual! D: If I've slept in passed 8am, it's a good Sunday! E: Quick morning meditation, journaling and a good sweat. P.S. You just launched your own workout set (adorable by the way!) Tell us about it: How did the collaboration come about? What inspired the design? Where can my readers go to shop? Thank you! This was our very first collaboration and we are so excited about it. We chose a brand that we'd worked with quite a bit before in the past, one we knew we could trust and feel amazing promoting to our followers. We wanted to create a set that we would personally love to wear and felt authentic to us. We found the scallops to be so chic, very Chloe inspired. We're all about cute, matching workout sets so this felt so right. You can shop them here!